September is Alzheimer's Awareness month. 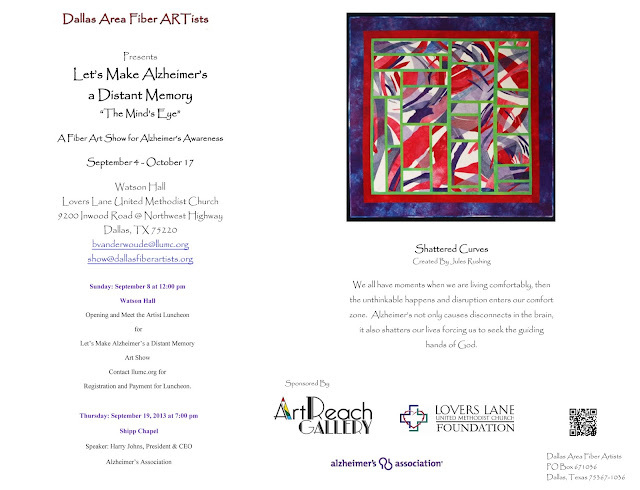 In prior posts I told you about the Dallas Area Fiber Artists show at Lover's Lane United Methodist Church during the month of September to help raise awareness of Alzheimer's. Here is the flyer for the show. I am quite honored that Shattered Curves was chosen as the promo artwork of the show. This mission is so near and dear to my heart. This past year has had its ups and downs. Trying to understand the disease we are now living with and working out new schedules and routines. Jeff and I have been able to travel and spend time with our grandkids (number 6 was born just this week). I'm blessed that we have so many good days right now and have been able to start working with the Dallas Chapter of the Alzheimer's Association. The Dallas Chapter Walk to End Alzheimer's is October 5th. We are blessed by the dedication of Venture Mechanical in forming a team again this year. If you would like to support my goal in fund raising for the "Rushing for the Cure" team, click here. You can also join our team from the same link. Jeff and I are dedicated in doing our part to raise awareness for research and caregiver support. One way I am working to making a difference is dedicating part of the proceeds of each piece of artwork I sell to the Walk to End Alzheimer's and each piece I make from here on will be with an Alzheimer's theme. This blog was started to talk about and show my art. It will now play a duel roll in artwork and talking about Alzheimer's. I feel it is important for me to be able to have an avenue to talk about what it is like to live the life of a wife of someone with Alzheimer's and how it is affecting my art and my life. I hope you will join me in this journey, I will enjoy your company!